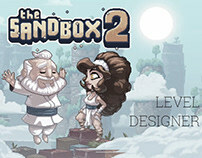 If you want to know what is the game about and maybe try some of the many levels I made for it, follow this link. 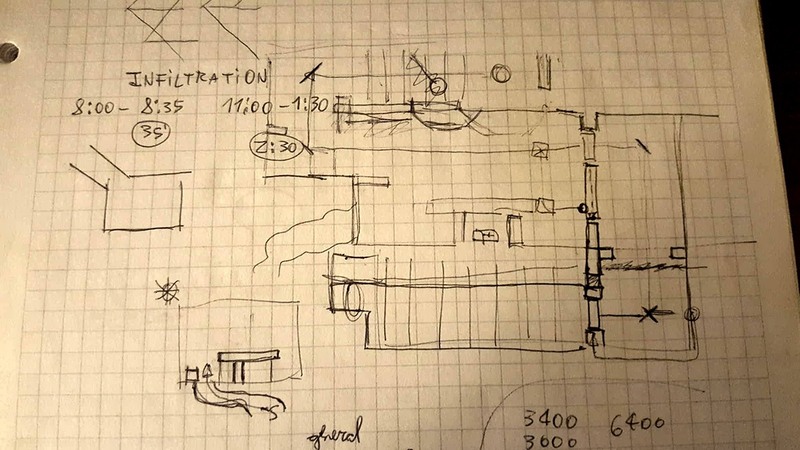 When making a level (even though we, the freelancers, had some basic directions and constraints) first thing is, of course, to choose a concept to explore. For me, the most fun to create levels where the ones I made when new updates came out. Probably the most interesting ones for the players as well. Not only because there was brand new content to showcase, that is easy to do. What I liked was to take some of the new mechanics and elements and see what interesting interactions could I get when mixing them up with old mechanics and materials. 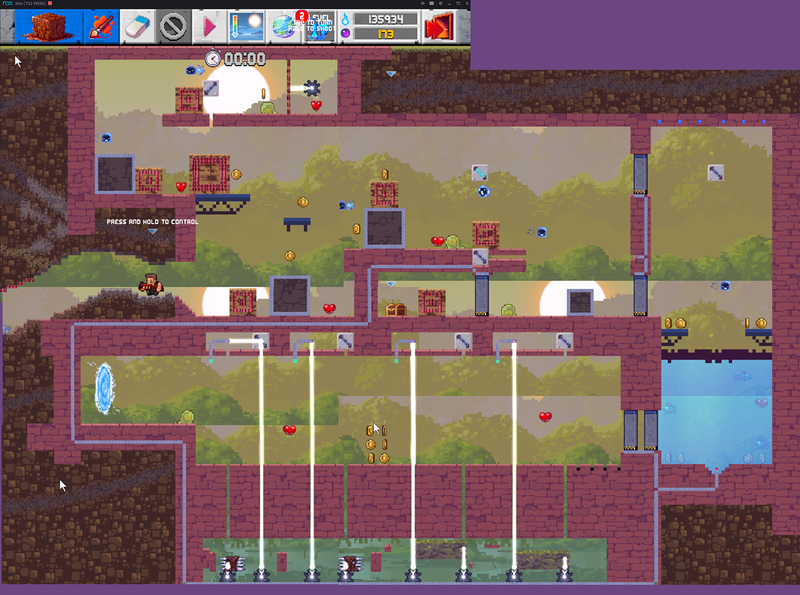 Here is an example: the lasers update is designed to work alone as a way to make puzzles with mirrors you can reorient. Without controlling an avatar, you can tap the mirrors until the laser reaches a "win trigger" particle. But I was thinking of ways to use it with one of the platforming characters (called avatars in game) as well. Bare in mind that a level's "win condition" can't depend on an avatar actions and switching mirror tiles at the same time, so mirrors had to be fixed in place. 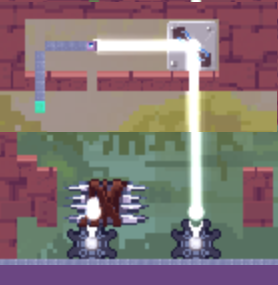 We could still block the ray with a breakable material, so the player has to clean the path for the laser. With that in mind I designed this device, that is tweaked so that only one of the rays reaches the censor at a time. 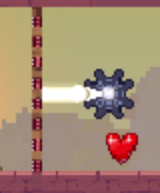 The thing with spikes moves automatically, working as a timer. The idea is that if the avatar steps in the way of the ray, the censor will activate, spawning some enemies. This way I managed to mix old and new mechanics to make something novel. 1 - First I experiment to find interesting interactions with the fresh materials from each update. 2 - When I find something juicy, I think of ways to showcase this mechanics... Emergent gameplay? 3 - Simple paper layout only if I'm not sure how to fit each location inside the canvas. 4 - Draft of the areas with basic brick lines. 5 - Draft of the thing I want to expose, some times a device like this, others is more like a puzzle. From then on I will start playtesting and iterating each step before moving on. 6 - Fill: some parts are only padding to fill the gaps between the juicy parts. This can be enemies, coins or other simple gameplay resources. 7 - When the level works is time to make it pretty. I try to mix functionality and visual theme in the previous steps, so this tends to be just adding some vegetation or details inside the solid ground. All this in around 4 hs, average. 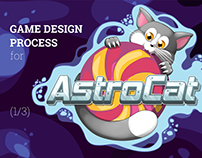 I must say that the editor and the game design where really nice to work with, and I couldn't have done such quality content without those 2 factors. 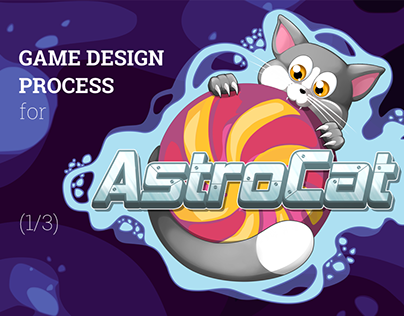 Well, that was just one possible approach for the levels, but other times the initial concept was not based upon the mechanics. 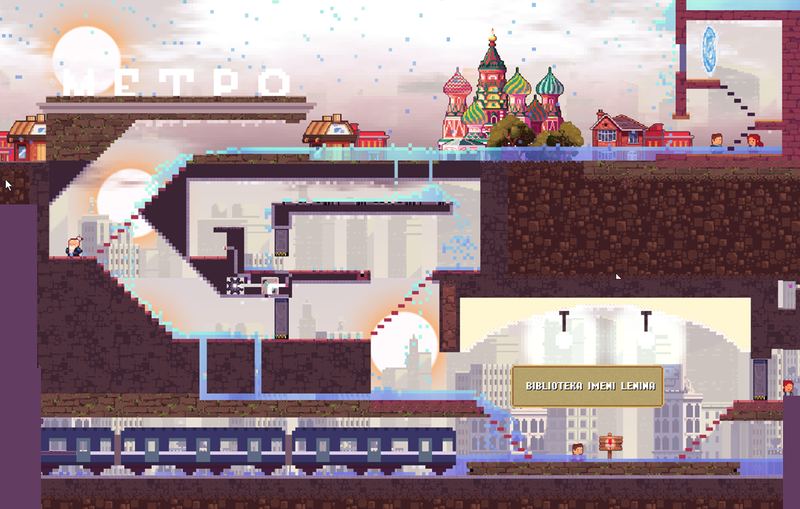 Some times the levels represented a given visual theme, like a Moscow metro station that is flooding, for the "natural catastrophes" update. This update was not only about natural disasters but also about places in the world. 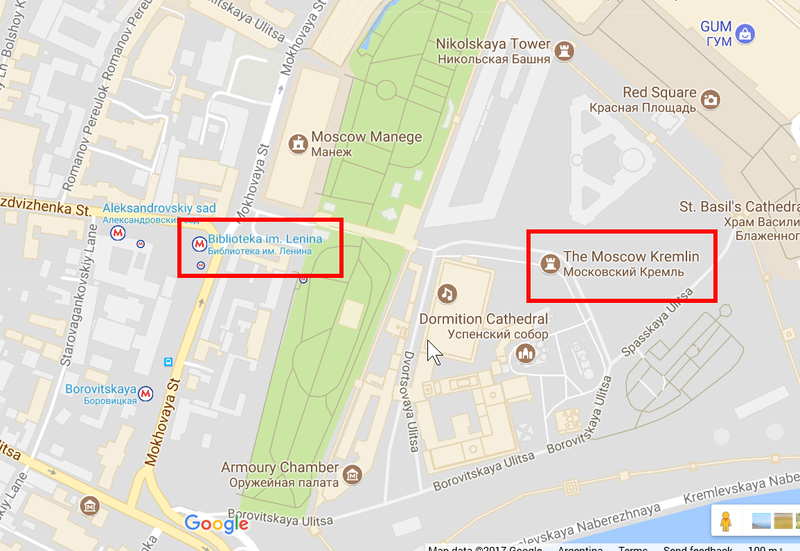 Even before doing the first draft of the level, I started by researching what was the most common natural disaster in Moscow. 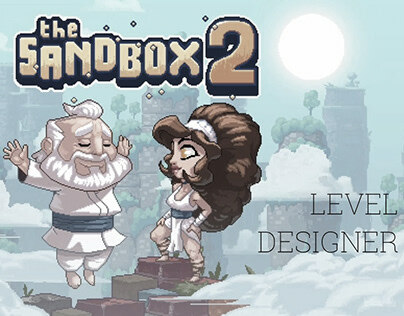 Here I explain the design process behind my levels for The Sandbox Evolution!